Entrée to Black Paris - Newsletter Archives - January 2004 - Paris - A Culinary Delight! Sunny skies greeted the participants of the first Afro-centric culinary excursion in Paris last November. The event, entitled Paris – A Culinary Delight, featured the presentation of a number of foods and beverages that comprise the traditional French meal. It also provided an opportunity for African-American culinary professionals who live and work in France to share their expertise with African-American and other travelers. The excursion was co-hosted by Entrée to Black Paris, a travel planning service, and EthnoTravel.com, a company dedicated to promoting multi-cultural travel. On Day 1, African-American cookbook author Monique Wells led the participants on a circuit to explore the worlds of coffee, cheese and bread. They first visited the coffee and tea shop Verlet, located on rue Saint-Honoré. This family-run establishment has sold coffees, teas and gourmet food items since its creation in 1880. The owner gave a presentation of the history, cultivation, and harvesting of coffee, and provided samples of three different coffees for tasting. 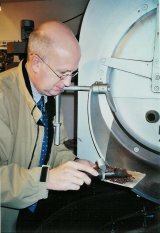 He then led the group to Verlet’s coffee roasting facility, where he demonstrated the roasting process. Upon leaving Verlet, Wells led the group to La Ferme Saint-Aubin, a cheese shop on the historic Ile Saint-Louis. Here, participants visited the17th century cellar where dozens of cheeses made from sheep, goat, or cow’s milk are aged. Obviously passionate about his profession, the owner told stories of the origins of the names of several cheeses, described the aging process, and indicated how to determine the quality of the cheeses that one can buy in France. Participants then partook of a bountiful buffet of cheeses and wine. The final event of the first day was a visit to the renowned Poilâne bakery, located near Saint-Sulpice and Saint-Germain-des-Près. After admiring a chandelier made from bread that hangs in the back office of the shop, the group headed downstairs to see the bake house. Here, two young men busily stoked the wood-burning oven and fashioned sourdough loaves as the group learned about the history of the site (a former monastery), of bread making, and of the bakery itself. Proceeding into the pastry room, participants observed how shortbread dough is turned into the delicate cookies that the bakery produces daily. Day 2 was devoted to wine production and wine tasting. On this day, Wells escorted the group to a vineyard and winery called Chemin des Vignes, located just outside of Paris. After greeting everyone at the entrance to the vineyard, African-American sommelier-conseil Melba Allen began the visit with an explanation of the history of wine making in the Paris area. She then led the group to the foot of the steeply sloped vineyard and explained how soil, climate and other conditions serve to create the characteristics of the wines that are produced from each harvest. Following a tour of the beautifully refurbished wine cellars that originally served as chalk quarries Allen engaged the participants in a wine tasting that culminated the visit. In the evening, the group retired to Percy’s Place, an African-American-owned restaurant in the Auteuil district of Paris. To the delight of all, proprietor Percy Taylor personally served the group. Great food, good music and light-hearted banter served to make this an intimate, memorable dinner. Day 3, the final day of the excursion, was devoted to pastry and chocolate. African-American pastry chef Klancy Miller led the group to four of her favorite confectioneries, and spoke about the features of their signature desserts. The highlight of the walk was a visit to the boutique created by Pierre Hermé, the most celebrated pastry maker in France today. The group was amazed at the sheer beauty of the products that they saw, and even more impressed with their flavors and textures. Chef Klancy provided expert advice as members of the group queried her about what to purchase for gifts to take home as well as what to purchase for immediate consumption. Happily laden with their packages, everyone proceeded to the nearby Dédicace Café, where a delectable lunch awaited them. Conversation was lively as people discussed the experiences they had shared. Participants were in agreement that professionalism was the watchword, that of the French and American culinary specialists who gave presentations, and that of the organizers of the event. Many expressed satisfaction that their visit to Paris went beyond the scope of standard tourist activities and permitted them to “get in touch with the locals” and to “experience Paris as only an insider can”. And all ended the excursion delighting in the sense of camaraderie that inevitably develops when people gather to learn about, and partake of, food and drink.